In The Four Agreements, a New York Times bestseller for over seven years, don Miguel Ruiz revealed how the process of our education, or "domestication," can make us forget the wisdom we were born with. Throughout our lives, we make many agreements that go against ourselves and create needless suffering. The Four Agreements help us to break these self-limiting agreements and replace them with agreements that bring us personal freedom, happiness, and love.Now don Miguel Ruiz joins his son don Jose Ruiz to offer a fresh perspective on the Four Agreements, and a powerful new agreement for transforming our lives into our personal heaven: the fifth agreement. The Fifth Agreement takes us to a deeper level of awareness of the power of the Self, and returns us to the authenticity we were born with. 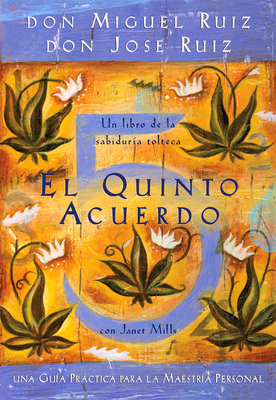 In this Spanish- language sequel to the book that has changed the lives of millions of people around the world, we are reminded of the greatest gift we can give ourselves: the freedom to be who we really are. Don Miguel Ruiz is the international bestselling author of The Four Agreements (over seven years on The New York Times bestseller list). He has dedicated his life to sharing the wisdom of the ancient Toltec through his books, lectures, and journeys to sacred sites around the world.In the tradition of his ancestors, don Jose Ruiz has dedicated his life to sharing the teachings of the ancient Toltec. For the past seven years, he has been lecturing and leading classes across the United States, and at sacred sites around the world.